**Note: the measurements given below are for 1:24 scale. 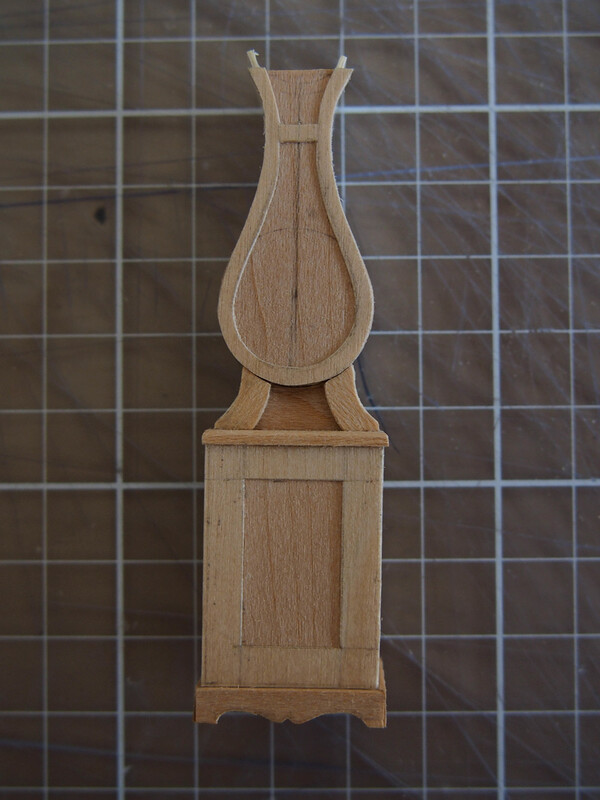 If you would like to make the clock in 1:12, double the measurements (including the wood thicknesses). 1. Begin by tracing out a pattern for the front top panel of your clock on 1mm wood (as shown above far left). 2. The front panel will have wood "panelling" which you can achieve by layering a piece of wood veneer over the 1mm front panel (as shown above centre). 3. Cut four pieces to form the base cabinet of the clock. These pieces should all be 28mm in length. The front and back panels should be 20mm in width and the side panels 12mm in width. 4. Next you must cut the round circle which will form the boarder of the clock face (as shown above). When cutting fine pieces of wood, you can avoid their splintering and splitting by backing them with masking tape (as shown above right). 5. Now you must embellish the base cabinet. Add a small lid/top of 2mm wood. Give this lid a small overhang over the cabinet but not too much (as shown above far left). 6. Add a skirting piece to the base of the cabinet as shown above middle and right. 7. The next two steps are tricky. You must make the cylinder of the clock head, as well as the joining piece for between the base cabinet and body of the clock. 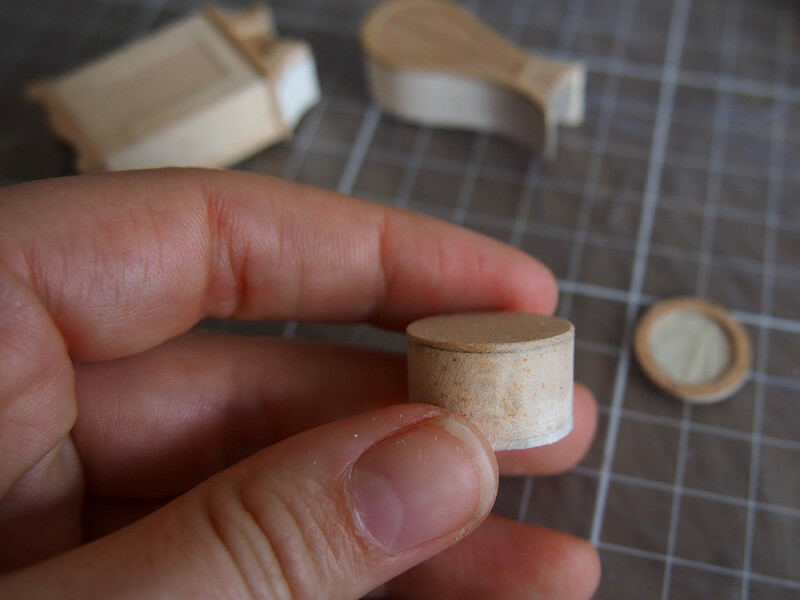 The cylinder should be cut from your 10mm piece of balsa wood (diameter of 17mm). 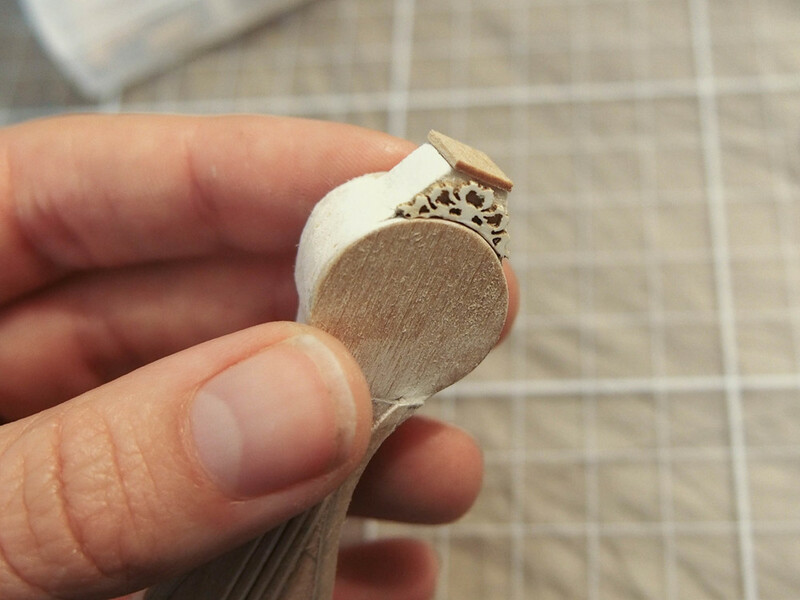 Use balsa because it is easy to cut and sand and is suited for this difficult shaped piece. If the balsa edge is rough, cap it with a piece of 1mm wood (as shown above right). The connector between the base and body should be made of 2mm wood and bent 1mm card (as shown above left). 8. Now you can shape the the sides of the body in 1mm card strips which you can bend carefully and glue to the front panel (above left). 9. Glue the base cabinet, connector and body together (as above right). 10. Now you must finish the head of the clock and clock face. 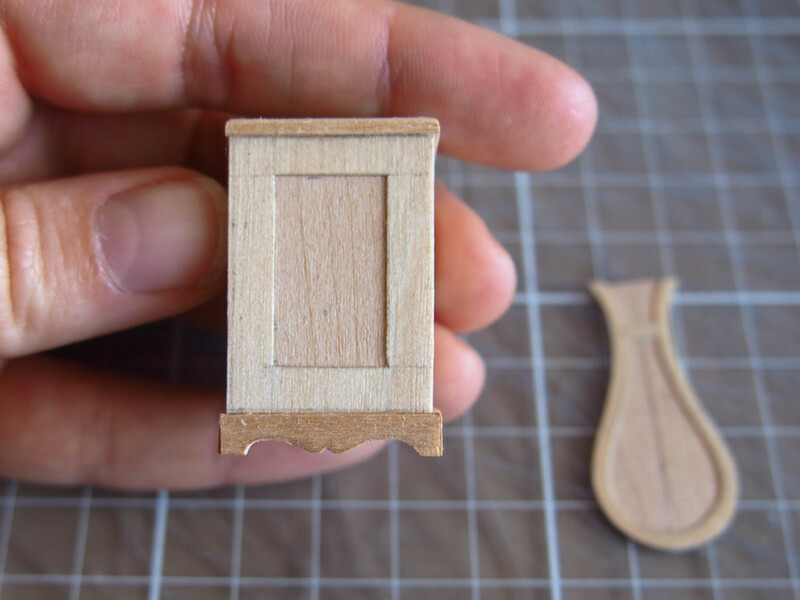 Add a small hat to the head of the clock with a small piece of balsa wood. You can also embellish this hat with a small piece of decorative card (you can use a cut out piece from embossed paper to so this as well). 11. Finish the clock head by using wood gap filler to ensure a smooth curve to the sides. 12. Now you must shape your acetate to give it a curved glass look. You can do this by laying your piece of acetate over the wood clock boarder you cut out earlier, and rubbing the inside with a clay sculpting piece (as shown above right). 13. You can then give the the front of the clock face a lyre pattern by cutting some small strips of the wood veneer and sticking them down as shown below left. Once this is done you can give the clock its first coat of paint. 14. Once the clock has been painted you can print and glue on the paper clock face, as shown above right. Create some clock hands with jewellery wire. Download the below jpeg files. While the display below may not look to scale, if you print them at their current size on an A4 sheet (do not choose "fit to sheet" in your printing options), they will come out at their respective proper scales for you to use.